The village of Kumarakom is a cluster of little islands on the Vembanad Lake, and this small water world is part of the Kuttanad region. An enchanting backwater destination, Kumarakom offers visitors many other leisure options. Kumarakom Houseboat cruise and fishing facilities are available at Kumarakom. Holiday packages on the houseboats, traditional Kettuvalloms, are an out-of-this-world experience at Kumarakom. The most suitable way to explore the breathtaking beautiful backwaters of Kerala is Houseboats. We offer Kerala houseboats tours in Kumarakom, Alleppy to explore the beautiful backwaters which are among the prime attractions of Kerala. Kerala houseboats are available on hire for tourists of all budgets. From traditional boat house/rice boat to modern luxury packed Houseboats are available on hire. On your Kerala houseboat tours you will have wonderful opportunity to see superb view of nature and live villages of Kerala. Talking of a Kerala Houseboat, 'Kettuvallam' ride, The National Geographic Traveler says, "It is astonishingly romantic to watch the sunset from one kettuvallam among several, while the three boatmen hang lanterns and a pearly glow fades behind the scrim of palms... Waking at dawn, we find ourselves surrounded by hundreds of fishermen skiffs on immense Vembanad Lake. It’s like time travel into a quiet morning of another century." Starting from Rs.5500/- per person, you have plenty of package options for Houseboat as well as backwater resorts from Rs.2500/- per person/night. 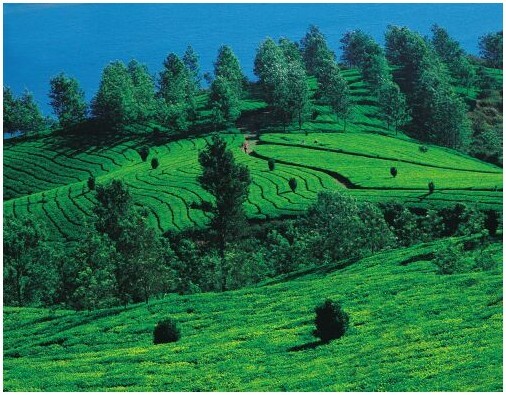 If you find Ooty, Kodaikanal or Munnar a bit too touristy and crowded a destination in southern India, Coorg is that perfect holiday spot in Karnataka that is sure to please toddlers, youth and the old alike. Not that this hill station needs to be chosen for a sojourn by eliminating other similar destinations in the vicinity. Just a three-hour drive from Mysore, 150 km away, Coorg district on its own has much to offer, beyond its coffee, cardamom, pepper and beetelnut estates. There is much to see, admire and soak in at this hill station, which the locals call Kodagu, on the slopes of the Western Ghats, what with some pristine trekking trails, picnic spots, waterfalls, wildlife, woods, forests, valleys and some mouth-watering cuisine. Situated at a height of 1,525 metres, Madikeri or Mercara is the capital of Coorg, with a nice bazaar, quaint houses with red-roofs and liberal use of teakwood reapers for doors and furniture, so common among homes and clubhouses in Indian hill stations. It may come as a surprise to some that Coorg has one of the largest settlements of Buddhists in India, just about 30 km away from Madikeri, with their own Namdroling Monastery built in 1963, which the locals call the Golden Temple. Once you enter the monastery, you feel transported into some other world in the Orient, packed as it is with some 5,000 monks in bright yellow and red robes, with some soothing Buddhist chants, smell of incense and breathtaking sights of pagodas. After seeing those large golden statues of the Buddha and Tara, the intricate murals and Tangkha paintings, don't forget to taste some authentic Tibetan food here, especially the delectable momos and the subtle thugkpa, their noodle soup. One is told it is the largest teaching centre of Nyingmapa - a major lineage of Tibetan Buddhism in the world - and the present Dalai Lama gave its shorter name, as opposed to Thegchog Namdrol Shedrub Dargyeling that this mesmerising place was called originally. Before dwelling further, where to stay is a question that is bound to crop up. While there are plenty of hotels and resorts, including the Orange County, that can even set you back by as much as Rs.25,000 per day, it is best to opt for a home stay. There are some 35 of them in and around Medikeri in a range of Rs.1,000 to Rs.5,000 per day where one gets not just to retire but also taste authentic Coorgi food and take some refreshing strolls on their plantations that grow coffee and other cash crops. As far as the season goes, October to March -- like most places in India -- are the best months. The weather is pleasant with that welcome nip in the air. But Coorg during monsoons can be equally mesmerising and enchanting. There are also plenty of places one can go to. There is Abbey Falls, not far, where one has to make his or her way through some dense woods, dotted with coffee bushes, trees and creepers, to suddenly find a cascading gush of water. Then about 80 km away is the Iruppu Falls, right next to the Rajiv Gandhi National Park, also called Nagarhole, which is famous for its elephants, with a lot of other game and some 50 species of birds. Children, especially, are certain to enjoy a visit to Dubare Forest, around an hour and a half from Medikeri. A ferry there takes you across to an elephant camp where one can see the pachyderms being bathed and fed, after which they are ready for a joy ride. Talacauvery, around an hour away, is the source of the river Cauvery, with a temple to pay homage to this main source of water for some parts of Karnataka and Tamil Nadu. Not far is Bhagamandala, the confluence of three rivers: Cauvery, Kanika, and Sujyothi. Another must-see is Tadiyendamol, which is the tallest peak in Kodagu and gives a breathtaking view of the entire Coorg, apart from the distant Arabian Sea. There is also the Naalkunaadu Palace built by Kodagu king Dodda Raja Veerendra in 1792. After all this exploring, a bungalow at the plantation is perhaps the best place to retire. Toddlers can chase butterflies, and a hammock and freshly brewed coffee are sure to be at hand! How far: Around 150 km from Mysore and 260 km from Bangalore. How to reach: By bus or car from Mysore. Closest airport is in Bangalore; the airport in Coimbatore in neighbouring Tamil Nadu is another alternative. Cost: Around 35-40 home stays in Coorg ranging Rs.1,000 to Rs.5,000 per day. Good and economical hotels are also available.